SERVING NORTH TEXAS and SOUTHERN OKLAHOMA! Deal’s Estate Sales specializes in Entire Home Liquidations, with antiques and vintage items being our area of expertise. We have 27 years of experience in buying and selling antiques and vintage items. We promise to give your home and treasures our utmost attention, as we never have more than one sale per week. We never split up our staff, giving your home our full attention and the respect it deserves. Our focus is on Quality. We have a full staff in place for security of your items. Ask us how we differ from our competition! Our past clients are happy clients! Plenty of references available, and we are rated A-Plus on several consumer websites. We are a family owned and operated business, we are licensed, bonded, and insured. Call us today at 469-556-0450 to set up a free consultation. Western decor, a boat(will update info on this when I get it) costume jewelry, kitchen, appliances, household, belt buckles, knives, furniture, and so much more. Be sure to see all photos. Be sure to see all photos! A sweet eclectic sale! Horse trailer, horse-related decor, furniture, Piano, crystal..and more. Will update as we continue to prep this sale! 60+ Years Accumulation! Amazing sale, every room is packed. Vintage Christmas, books, overflowing kitchen, clowns, clothing, furniture, and so much more. Be sure to see all photos! Be sure to see all photos of this sale! Cute sale, something for everyone. Furniture, linens, clothing, potted plants, appliances..Be sure to see all photos.Please do not block driveways! VINTAGE CLOTHING!! antiques, Hull pottery, full kitchen, garden items..so much stuff, you WON'T BELIEVE IT! Be sure to see all photos!! This is a wonderful sale! Full home and shop, see all photos! DEAL'S Richardson Estate Sale Coming soon! DEAL'S Mid Century Delights and Massive Stamp Collection in Dallas Estate Sale 2 CARS!! DEAL'S Super Packed Plano Estate Sale NEARLY 400 PHOTOS! Very full home with a garage, and separate building. Lots of garden statuary and cast iron decor. Furniture, full kitchen, Gary& Davis vintage car headlights, possibly from a Cadillac. Records, vintage 1980's clothing, Christmas, and MORE! FULL Home and garage! 2012 Nissan Altima 2.5 S with 15k miles! details and photos to come soon! It's like stepping back into the early 1960's! China, Waterford Crystal, Depression glass, French Provincial furniture, pool table. We have a super packed home! Over 400 photos! Gorgeous home, see all photos! Full home and garage! See all photos! Garage-kept 1987 Mercury Grand Marquis, only 47,674 miles! furniture, COLLECTIBLES, AND SO MUCH MORE! very full home and garage! Full of vintage, see all photos! DEAL'S QUILTING and SEWING Supply Galore and MORE in Dallas Estate Sale! taxidermy, books, décor and furniture, Pyrex, pool table, very full kitchen, clothing, etc. Photos coming soon! We have over 500 photos of this amazing, beautiful estate. Sale of the week for sure! Be sure to see all photos! Antiques, Organ, garage, and so much more! Full home, Bernina sewing machines, LG and Kenmore Elite appliances, JJill, Chico, Justin, Resistol, Stetson..just to drop a few names. Tons of jewelry. Brighton Purses, shoes and jewelry!! VERY full home, antiques and tools! Full home and garage! Check out all of the photos! DEAL'S Eclectic Sale Home is full of Collectibles Records and More! In Garland! Interesting sale, full of treasures! Be sure to look at all the photos! Full home and garage! Cool sale, chock full of old stuff! Be sure to see all photos! This company has posted a total of 151 estate sales. Only the most recent 50 sales are shown. Robert & Christa Deal did our father's estate sale last weekend. They did an excellent job in displaying, pricing, and selling. They are wonderful people, and I highly recommend them if you need an estate sale. We will definitely use them again when the need comes. Thank you Robert and Christa for a fine job done. Deal's Estate Sale did the estate sale for my fathers estate when he passed. If you could give them a rating of '10' I would. They told me not to throw away anything as I went through the house. They advertised, went through everything, threw away the trash, set up, sold, boxed the left overs and cleaned after themselves. I was unable to be at the sale so I sent in two people to check it out for me. The reports were great. Steady flow of people. People waiting before it started. Set up of sale incredible. Clear and concise policy posted. Sales team was professional and efficient. There were a couple of people who gave her their number with interest in buying the house. One made me an offer yesterday and he too commented on how impressed he was with the estate sale. They made an absolute horrible situation bearable and manageable. I could not have made it through this without them. It went very well. I live in a different town than the sale took place in and they handled everything for me beyond expectation. The Deal's are incredibly competent in their line of work and are able to make the process of an estate sale go very smoothly. Robert and Christa are also very kind and fair people, I would not hesitate to refer them to any one. Do interview several people to feel comfortable with the ones that will take over your home. Deal was excellent. Do find out what happens when the sale is over. Deal handled everything. I live 5 hours from where the sale was happening, and they were able to handle everything, and lock up a clean house when they were done. I didn't have to come back behind them. Both Mr & Mrs Deal were very professional and pleasant t work with. The Deals managed my Mother's Estate Sale. After the family had sorted through items and taken what we wanted, they went through the entire house - including the attic - and sold them in a 3 day estate sale. They charge a commission, and items not sold are donated to charity and we got a donation tax receipt. They were great. They are friendly, know how to price items, and were nice enough to put aside items that they thought we might want to keep in the family. When the sale was over, the house was left completely empty and swept clean. Such a help during a difficult time. My mistake was not keeping some of the things before they got there - I gave clothes to charity, and threw out things like partially used shampoo, etc, that the Deals later told me they'd rather take care of - it's amazing what they can sell. I highly recommend them, and have already to friends. Thanks for the opportunity to write about a great American business. The Deals did an exceptional job and I rate them A+ or 10/10 in all areas of pricing, efficiency, effectiveness and integrity. Being overseas, I called over 20 estate sale companies and after talking with Christa and Bob there was no question in my mind they were the folks for the job. They were professional, courteous, creative and during a very delicate time, showed my family great compassion. I had the opportunity to meet the Deals during a trip to Texas and after a few minutes talking with them, I can feel their energy and passion for their work. When I saw all the property that needed to be cleaned, sorted and priced, I was overwhelmed, not to mention being on a tight schedule to sell the house. The Deals never missed a beat and projected calmness and confidence throughout the process. Their crew came in and everything was prepared and ready for sale in record time, it was magic. Their prices are reasonable and they deliver premium service before, during and after the sale. Their integrity is exemplary as a company and as two wonderful people, and they love animals. Although I'm overseas, I have several friends in Texas and when they ask, I recommend Christa and Bob knowing they’ll always receive the best quality of service. Thanks Christa and Bob for all the hard work you put into our sale and for all the others you’ve assisted in the community. Finding a reliable, trustworthy source to help you sort through a loved one’s estate is probably one of the hardest things a son or daughter has to do. When my wife’s mom passed, she had accumulated a lot of personal property. We never had gone through that type of experience and we needed all the help we could get. To our good fortune, my wife’s brother was able to locate Deal’s Estate Sales from as far away as Germany. I was convinced that no one would be able to sort through 60 years of personal belongings and be able to stage all that stuff in sensible lots and be able to sell most of it for reasonable prices. But Christa and Robert Deal pulled it off. And what normally would be a painful experience, especially for my wife, was actually made so easy, all because of the thoughtful and expert handling of Christa and Robert and their fabulous staff, throughout the entire time. This was not the business dealing you might associate with the typical estate sale. The Deal’s approach was filled with care and empathy, as if they were a loving family member taking charge and handling the process that you so dread. And I never met two people who emit such honesty and integrity. So much so, that we became friends and have been ever since. When it was all done, the stuff that was not sold was given to charity and the Deals personally cleaned up my mother-in-law’s residence so that it was presentable for sale. Again, their professionalism and the dedication to making the process as painless as possible was beyond expectations. I have made recommendations before, but none have come with this heartfelt debt of gratitude and sincerity. My wife, Pat, her brother, Robert, and I recommend Deal Estate Sales to anyone who finds themselves in need of disposing a loved one’s lifetimes acquisitions with care, compassion, and integrity. After interviewing several companies in the North Texas area, we decided to hire Christa and Robert Deal to handle the very daunting task of settling our parents estate. Quite frankly we were overwhelmed at the mere thought of cleaning everything out. Christa and Robert arrived exactly as scheduled, were exceedingly professional and we instantly knew everything was going to be fine. With no more than 4 appointments they had everything sorted, cleaned, organized and priced. Prior the start of the sale they handled all advertising and photography on social media and it created so much excitement we had a line of customers down the entire block the first morning. The sale was staged through out the entire house and they had an employee in each room to watch over our property, answer questions, and generate sales. 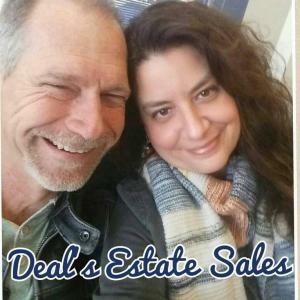 Deal's Estate Sales has quite a following of fans because they are known for their honesty, friendliness, their knowledge, and their fair pricing. Our estate sale was a complete success and we couldn't have been happier with the way it was handled by the Deal's and their staff. As promised they boxed up all remaining items, they scheduled pick up from the charity of our choice and then cleaned the entire house of all remaining trash and debris. Not only was I completely satisfied with the sale, I know I have made a friend in Christa for life and if I ever move back to Texas I would love to go to work for her! I would wholeheartedly recommend their services anytime you are in need of an estate sale or just down sizing. My mother-in-law passed away in April. My wife and I live out of state so we had to do EVERYTHING by long distance. We had two other estate sale groups completely flake out on us. We were so fortunate to find the Deals. They handled everything with superb professionalism and care. Having to deal with so many other things, it was wonderful to know that we didn't have to worry about the estate sale at all. They took the industry standard percentage of sales and then boxed up and arranged to donate anything that didn't sell. Please use these folks! They deserve your business! ...It looks like you did very well I am pleased with the results Thanks for working so hard to get this done. I had the pleasure of working with Christa and Robert Deal and their staff in preparing for my mother’s estate sale. When I first started the process of liquidating I thought I could do it by myself. After going through the closets, attic and garage I felt overwhelmed and knew it was more than I could handle alone. I contacted Deal’s Estate and they said not to worry they would handle everything. Throughout the entire process they were very professional and compassionate regarding my mother’s possessions. I could not have done this without them. During the three day sale they kept me updated daily as to the progress. At the end of the sale they had lived up to their promise. I would highly recommend them when you are faced with a similar situation. Vicki and I appreciate you and your whole crew! It has been a very emotional time! We are moving forward together. We have dreaded this day, working with you and Robert have made it easier on us! You and your and your team did an awesome job. We really appreciate it. Thanks for you great job. We will recommend you. Christa and Robert are two of the nicest people you will ever meet Deal's Estate Sales went that extra mile over what I expected...it simply amazed me that they could organize everything in my M-I-L's home and sell most of it We were lucky to have them arranged the sale and lucky to call them friends. To anyone even considering using this service: They offered us much needed organization and service in a turbulent time. The sale surpassed anything we could do on our own. The property was safe and left READY to list. They took so much weight off our shoulders... I Just can't say enough: Thank you for caring soo much. Honest Through. Hard working. Caring. Superb.